Prayer in schools? Animal sacrifices in public? Ten Commandments on the courthouse lawn? Jay Wexler has seen it all . . .
After ten years spent riddling over the intricacies of church/state law from the ivory tower, law professor Jay Wexler decided it was high time to hit the road to learn what really happened in some of the most controversial Supreme Court cases involving this hot-button issue. 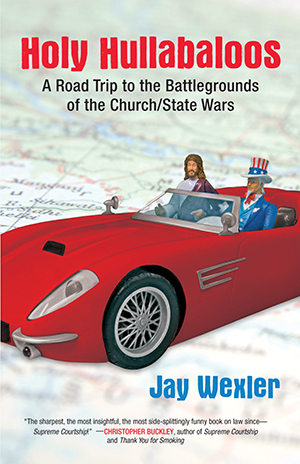 In Holy Hullabaloos, he takes us along for the ride, crossing the country to meet the people and visit the places responsible for landmark decisions in recent judicial history, from a high school football field where fans once recited prayers before kickoff to a Santeria church notorious for animal sacrifice, from a publicly funded Muslim school to a creationist museum. Wexler’s no-holds-barred approach to investigating famous church/state brouhahas is as funny as it is informative. “Religion and politics are the two things we are not supposed to talk about. Jay Wexler does—with deadpan humor. We need to tone down the anger over these issues, and he shows the way.” —Alan Wolfe, author of Does American Democracy Still Work? "In a book that is by turns irreverent, obnoxious, arrogant, silly, and probing, Wexler examines a number of issues related to the practice of religion and its fraught relationship with the government with which these practices must co-exist. . . . Wexler’s book joins Timothy Beal’s Roadside Religion in revealing the power of American religion in contemporary culture."